Zucchini – a truly versatile vegetable. It is possible to prepare a variety of original and delicious dishes. Zucchini jam, bake a pie, prepare the second dish. Very tasty and diseases of zucchini. 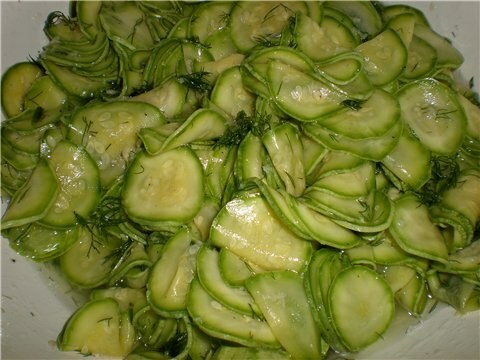 Zucchini in Ukrainian – a vivid example of a delicious and original snacks. Zucchini, whose diameter is not more than 6 cm long, wash thoroughly, cut off the stalk and slice it into thick slices about 2 cm and Fry sliced zucchini in vegetable oil until slightly Golden brown and place them on a dish in a single layer to cool. Garlic finely chop and RUB thoroughly on the Board. Dill and parsley wash, drain off water and chop not too finely. On the bottom dry and clean jars to pour the oil (use the remaining half of the oil, since half was spent roasting), add vinegar, salt, chopped fresh herbs, crushed garlic and tightly lay slices of zucchini. Fill banks should be up to the level of 2 cm below the neck. Banks to cover pre-boiled lids, and then sterilized at a temperature of 100%. Banks with a volume of 0.5 l to sterilize should be 10 minutes, 1 l – 15 minutes. After heat treatment the banks are closed and, turning down the neck, cool. Zucchini stimulate the digestive system and positively affect the update process of the blood. Courgettes are part of the varied diet and has many beneficial properties. The Bank, which will be used in conservation, should be thoroughly washed. It is very good to use baking soda, which you can scrub glass jar squeaky clean.